You know you are in education when you are working to discourage idling cars because of the cold and simultaneously reminding others that they should wear warm clothes. 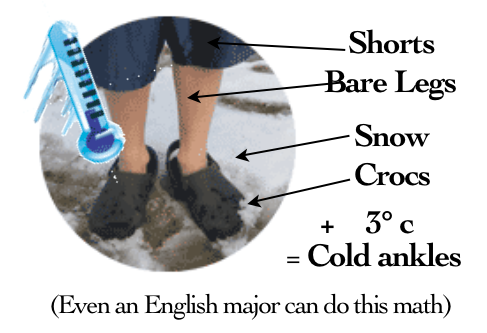 However, I understand it can be difficult at times for adolescents to recognize appropriate winter clothing so here are a few tips which may be helpful to provide them: Generally, if the words “snow” or “winter” precede the article of clothing it is what they are looking for. Please also try to remind them about “gloves” and “hats” which, admittedly, can be tricky because they do not include either the word “snow” or “winter”. Note that teeshirts and shorts, even if they have words “snow” or “winter” printed on them, should not be mistaken as winter clothing. Again, this can be an understandable misinterpretation of this concept. Despite my complete lack of fashion sense I understand that “really cute sandals” are popular, but I believe they clash with blue toes, (I will have to check with my daughter to confirm that, however.) We build ‘em rugged in Lyme, but let’s make warm and healthy the new fashion.